In this paper we present a report on our participation in the CLEF 2007 Chinese-English ad hoc bilingual track. We discuss a disambiguation strategy which employs a modified co-occurrence model to determine the most appropriate translation for a given query. This strategy is used alongside a pattern-based translation extraction method which addresses the ‘unknown term’ translation problem. 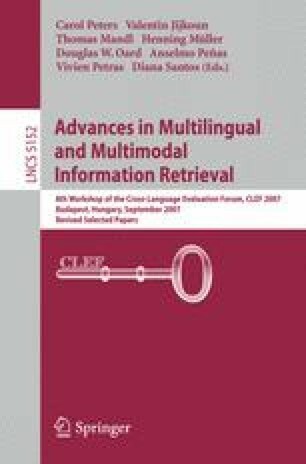 Experimental results demonstrate that a combination of these two techniques substantially improves retrieval effectiveness when compared to various baseline systems that employ basic co-occurrence measures with no provision for out-of-vocabulary terms.